Bring your own beer, wine, cider, sparkling seltzer and mikes hard lemonade type drinks in addition to all of your own food and snacks. 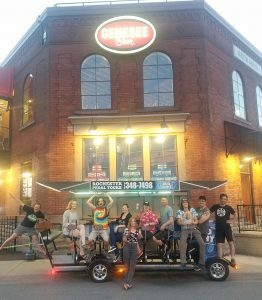 We are your tour guide and DD as we take you all around Rochester. 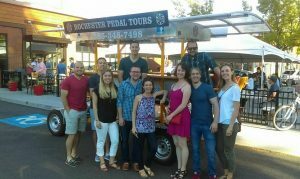 This is the perfect way to show off Rochester craft beer scene to out of town guests or to celebrate any occasion. On this 2 hour tour you will make 3 stops of your choosing from the options provided below. 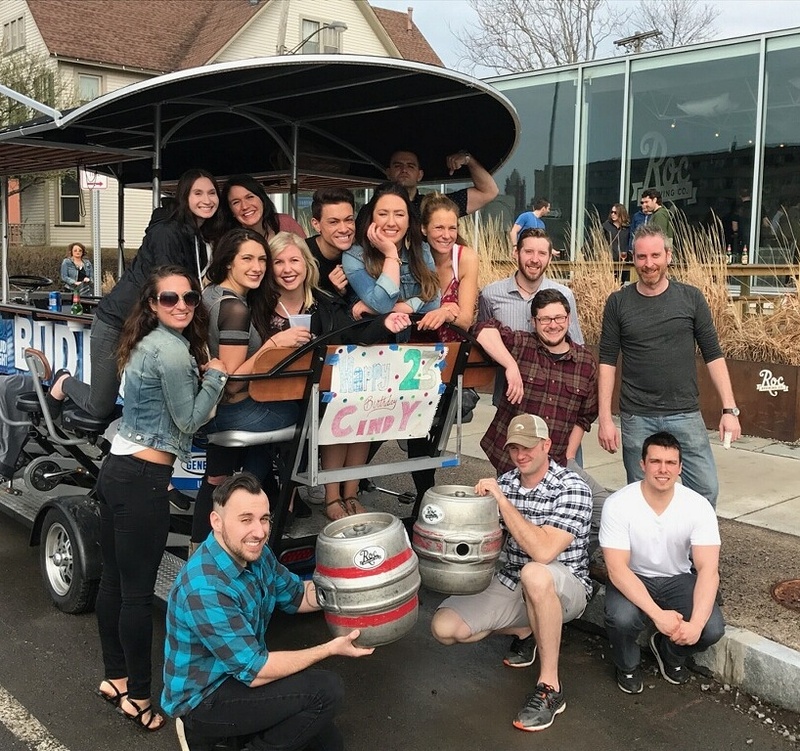 All of our tours begin and end at Marshall Street Bar and Grill which is centrally located so you have a bunch of great options to pick between. If you want to buy growlers or cans from the breweries on the tour we allow you to store them on the bike to bring home with you. What Breweries Will We Stop At? ROC Brewing is a stop on all of our different brewery tours but you can pick one of either Genesse Brewhouse, 3 Heads Brewery and Swiftwater. For the third stop we will go to a bar that is in the area around the second brewery you picked. But if you vist the Genesse Brewhouse -> 5th Frame Brewery -> ROC Brewing then you can visit 3 breweries. This is a perfect way to celebrate anything for your office especially if you have out of employees from outside the area in town and you want to show off Rochester to them. We understand that every office has a different alcohol policy so we have something for everyone whether it be a bar tour, brewery tour, food tour or the super fun architecture tour. You still drink on the architecture tour but instead of visiting 3 bars/breweries you only visit one as a halftime break. Bring your own beer, wine, cider, sparkling seltzers and mikes hard lemonade type drinks in addition to all of your own food and snacks food/snacks/appetizers/candy with you on your tour. The bike has a speaker that is bluetooth enabled for you to play your own music off of. Pro Tip sign up for the FREE week of Pandora/Spotify premium for the day of your tour. You pick the route as well as the bars that you will visit.